When do we persuade? 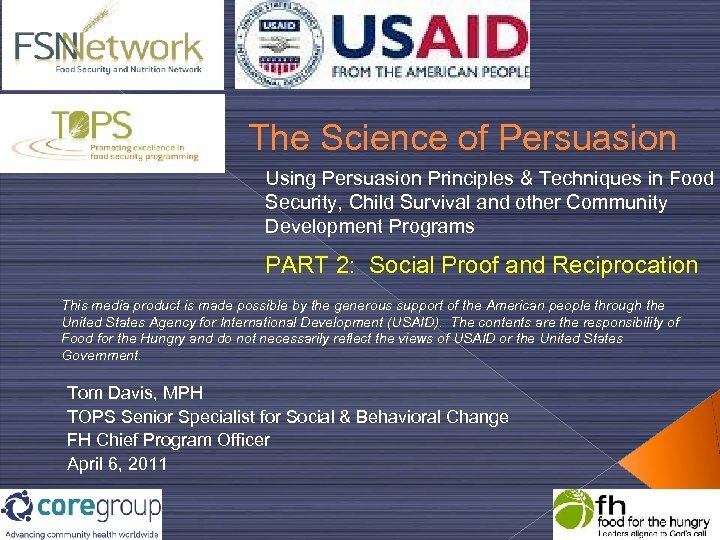 What are things that we try to persuade people to do in our programs? 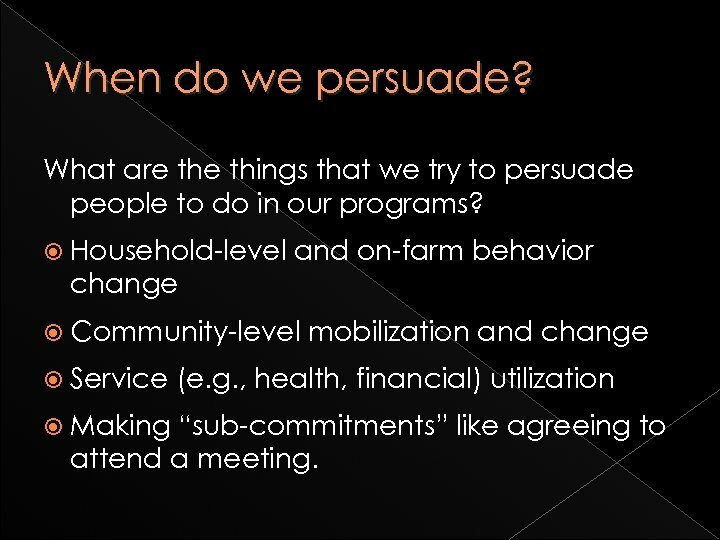 Household-level and on-farm behavior change Community-level Service Making mobilization and change (e. g. , health, financial) utilization “sub-commitments” like agreeing to attend a meeting. 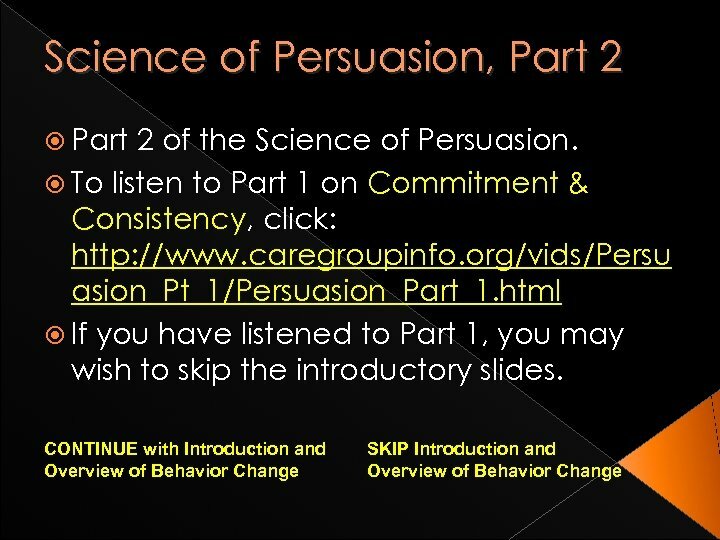 So persuasion is a part of behavior change. 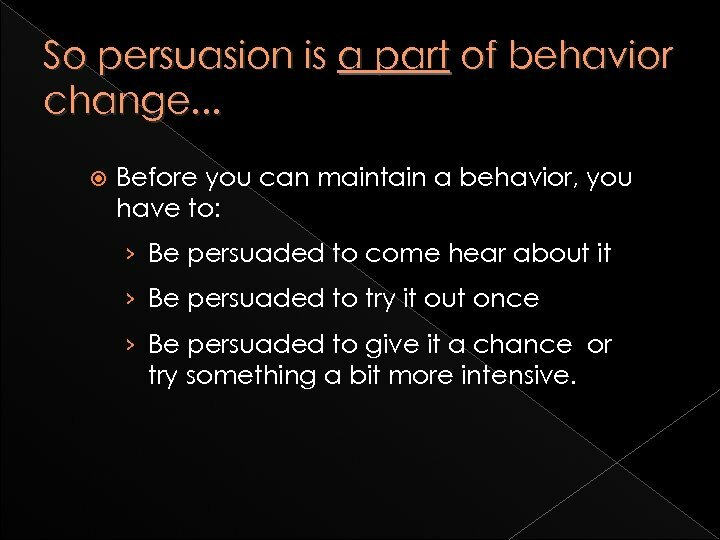 . . Before you can maintain a behavior, you have to: › Be persuaded to come hear about it › Be persuaded to try it out once › Be persuaded to give it a chance or try something a bit more intensive. 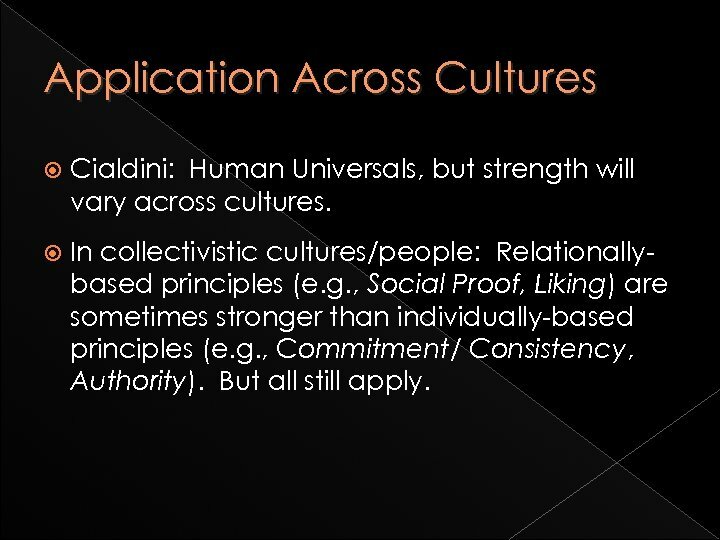 Application Across Cultures Cialdini: Human Universals, but strength will vary across cultures. In collectivistic cultures/people: Relationallybased principles (e. g. , Social Proof, Liking) are sometimes stronger than individually-based principles (e. g. , Commitment/ Consistency, Authority). But all still apply. 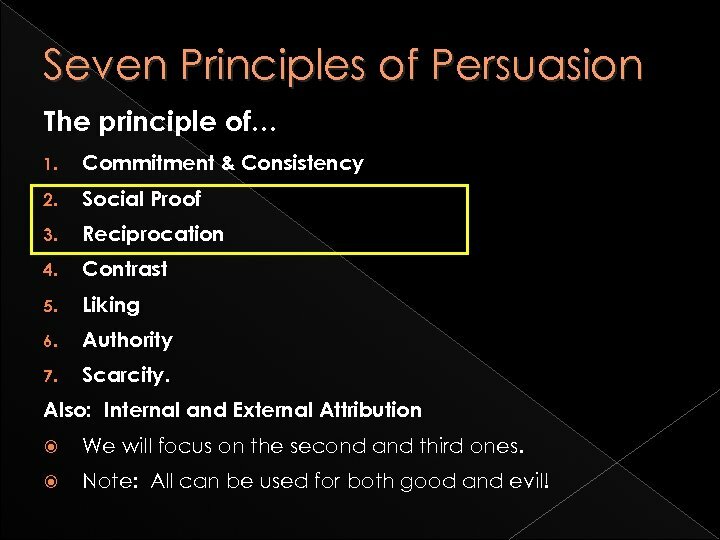 Seven Principles of Persuasion The principle of… 1. Commitment & Consistency 2. Social Proof 3. Reciprocation 4. Contrast 5. Liking 6. Authority 7. Scarcity. Also: Internal and External Attribution We will focus on the second and third ones. Note: All can be used for both good and evil! 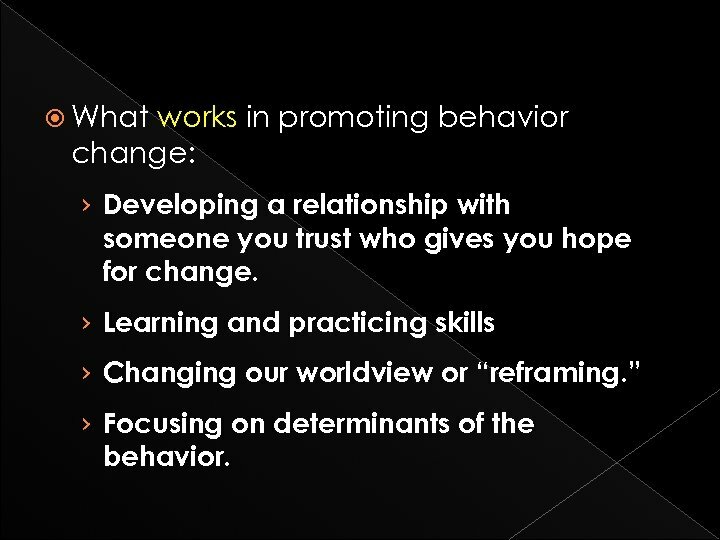 What works in promoting behavior change: › Developing a relationship with someone you trust who gives you hope for change. › Learning and practicing skills › Changing our worldview or “reframing. 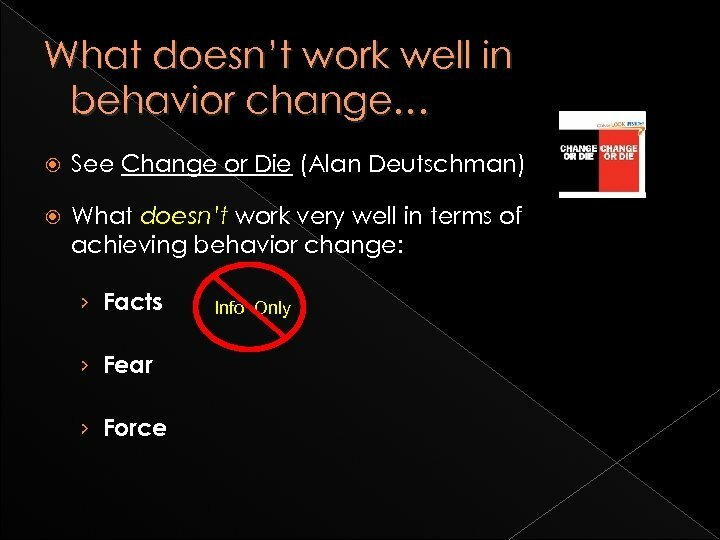 ” › Focusing on determinants of the behavior. “These techniques wouldn’t work on me. 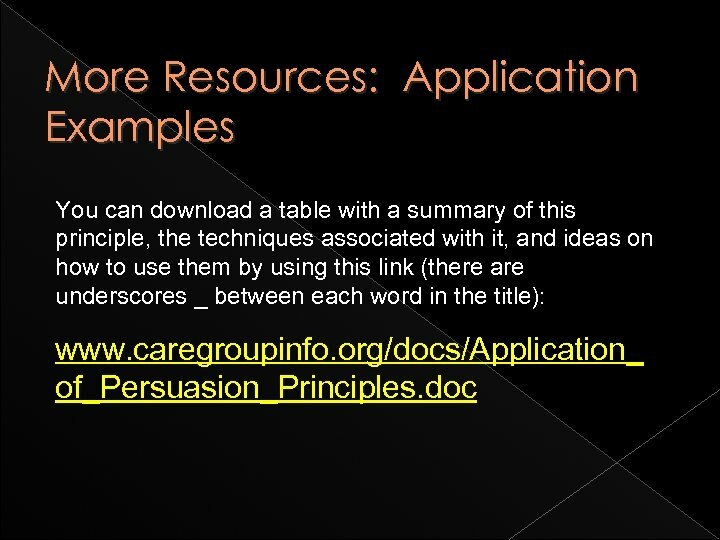 ” Two Routes to Persuasion We use both routes, depending on the context, time, etc. “WATTage: ” Willingness and Ability To Think. Central Route: High WATTage. Thinking carefully and with much effort – active, creative, alert (10: 00 a. m. thinking). Longer conversation in our heads that contain topical, relevant thoughts (e. g. , health decisions for health types). Central thinkers looking for facts, evidence, & examples, and use a lot of reasoning & logic. 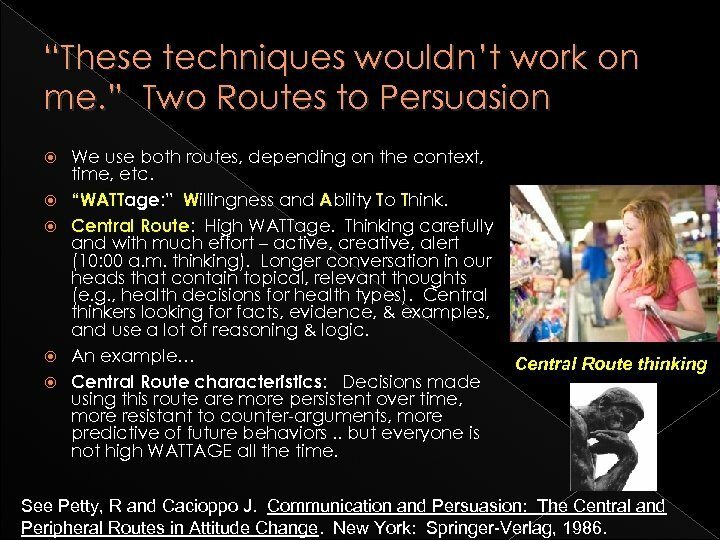 An example… Central Route characteristics: Decisions made using this route are more persistent over time, more resistant to counter-arguments, more predictive of future behaviors. . but everyone is not high WATTAGE all the time. Central Route thinking See Petty, R and Cacioppo J. Communication and Persuasion: The Central and Peripheral Routes in Attitude Change. New York: Springer-Verlag, 1986. 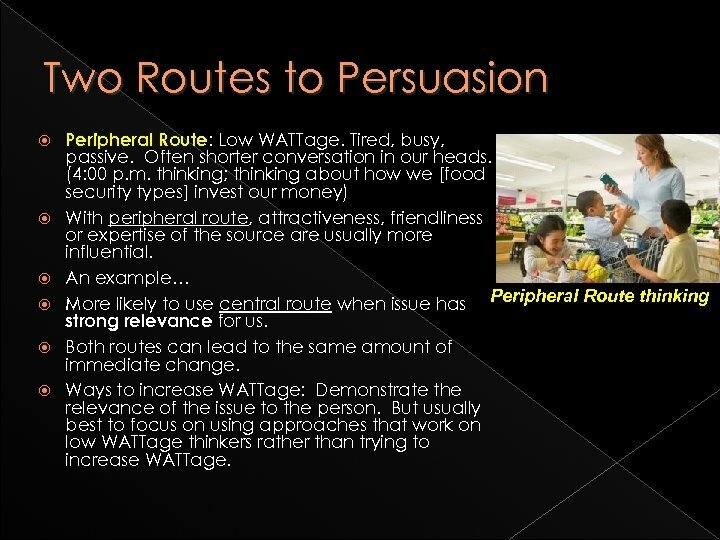 Two Routes to Persuasion Peripheral Route: Low WATTage. Tired, busy, passive. Often shorter conversation in our heads. (4: 00 p. m. thinking; thinking about how we [food security types] invest our money) With peripheral route, attractiveness, friendliness or expertise of the source are usually more influential. 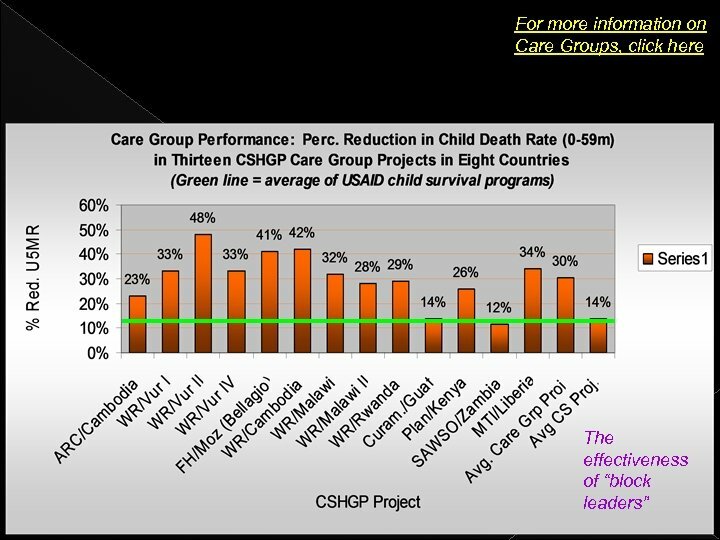 An example… More likely to use central route when issue has Peripheral Route thinking strong relevance for us. Both routes can lead to the same amount of immediate change. Ways to increase WATTage: Demonstrate the relevance of the issue to the person. But usually best to focus on using approaches that work on low WATTage thinkers rather than trying to increase WATTage. When to use what? 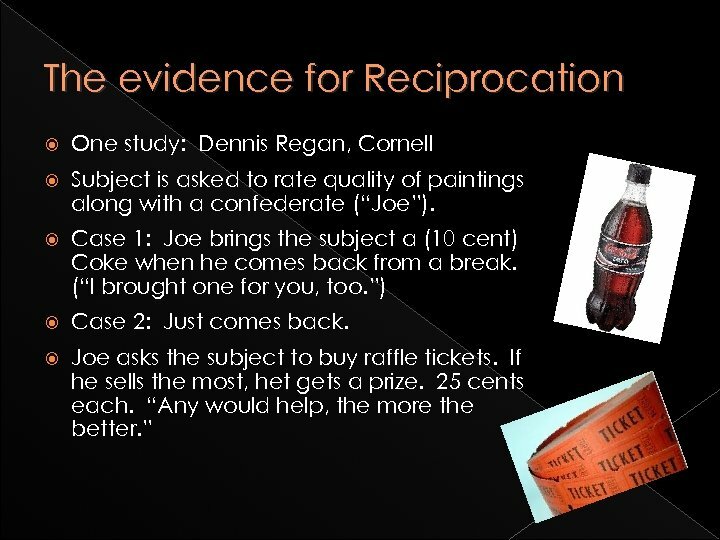 For someone who is using Central Route thinking, thoughtful persuasion works best: Using facts, evidence, examples, reasoning, & logic will often work. (What we usually do. ) 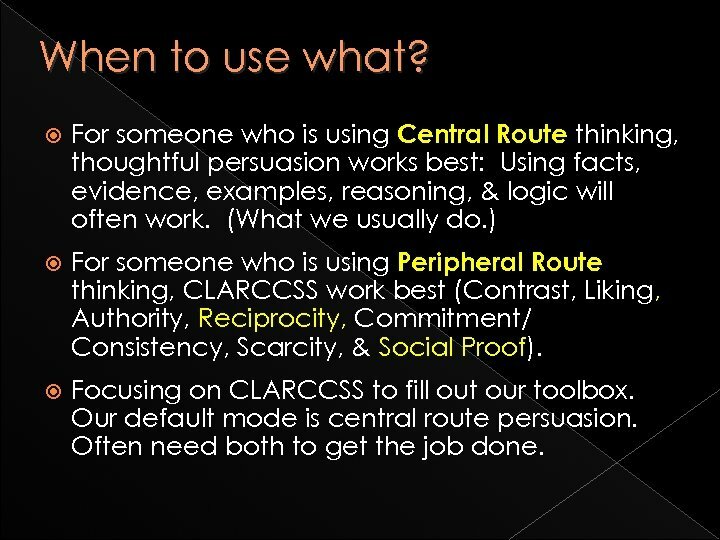 For someone who is using Peripheral Route thinking, CLARCCSS work best (Contrast, Liking, Authority, Reciprocity, Commitment/ Consistency, Scarcity, & Social Proof). Focusing on CLARCCSS to fill out our toolbox. Our default mode is central route persuasion. Often need both to get the job done. 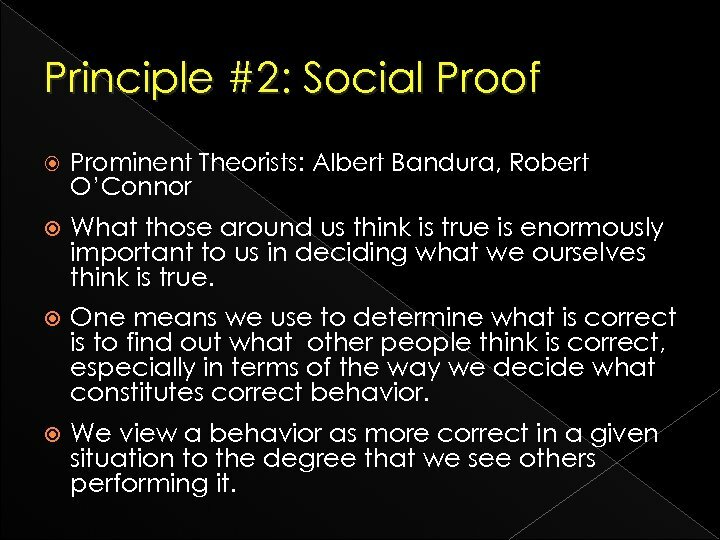 Principle #2: Social Proof Prominent Theorists: Albert Bandura, Robert O’Connor What those around us think is true is enormously important to us in deciding what we ourselves think is true. One means we use to determine what is correct is to find out what other people think is correct, especially in terms of the way we decide what constitutes correct behavior. We view a behavior as more correct in a given situation to the degree that we see others performing it. 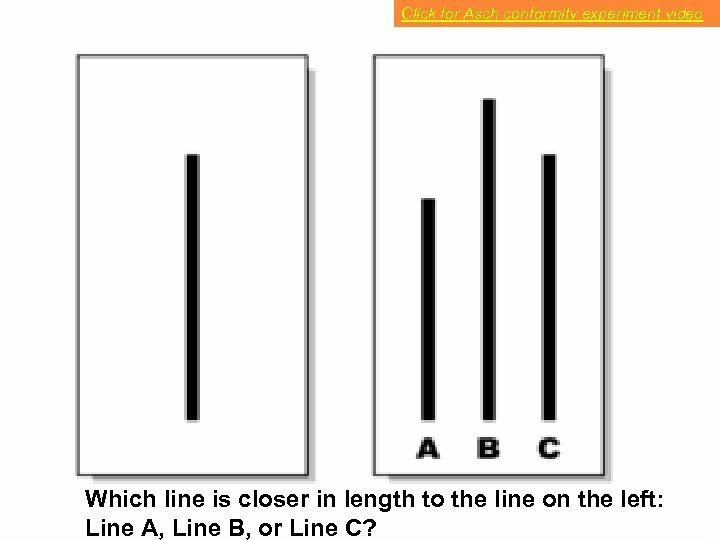 Click for Asch conformity experiment video Which line is closer in length to the line on the left: Line A, Line B, or Line C? 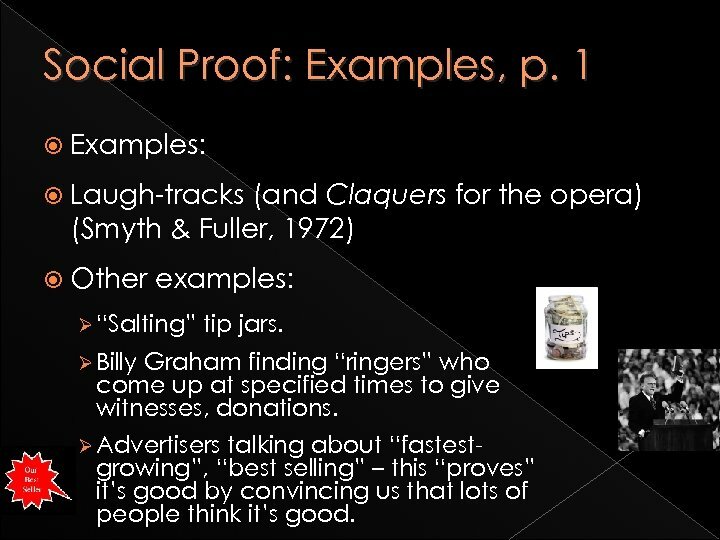 Social Proof: Examples, p. 1 Examples: Laugh-tracks (and Claquers for the opera) (Smyth & Fuller, 1972) Other examples: Ø “Salting” tip jars. Ø Billy Graham finding “ringers” who come up at specified times to give witnesses, donations. Ø Advertisers talking about “fastestgrowing”, “best selling” – this “proves” it’s good by convincing us that lots of people think it’s good. 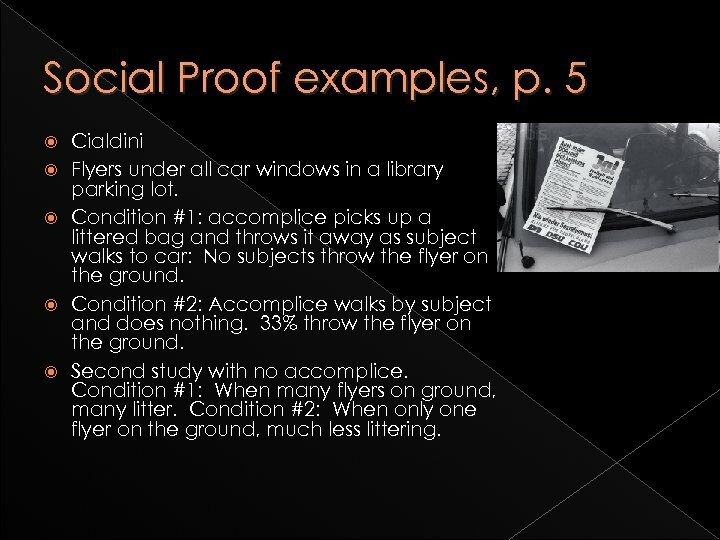 Social Proof examples, p. 5 Cialdini Flyers under all car windows in a library parking lot. Condition #1: accomplice picks up a littered bag and throws it away as subject walks to car: No subjects throw the flyer on the ground. Condition #2: Accomplice walks by subject and does nothing. 33% throw the flyer on the ground. Second study with no accomplice. Condition #1: When many flyers on ground, many litter. Condition #2: When only one flyer on the ground, much less littering. 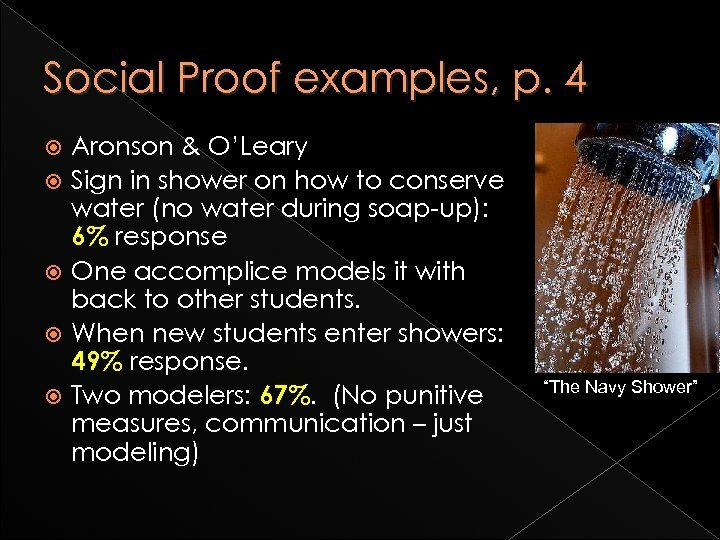 Social Proof: How can we use it? 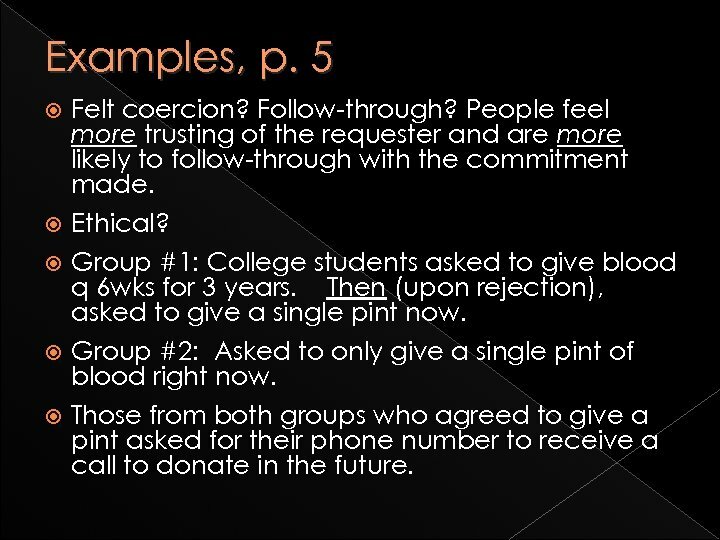 Do small scale surveys (sample) on agreement with phrases that require no commitment increasingly strong statements. 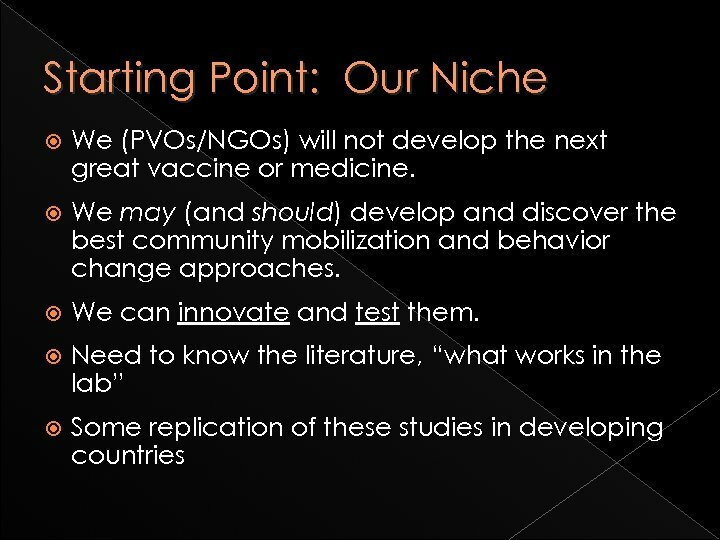 Disseminate results. Use more guided testimonials. 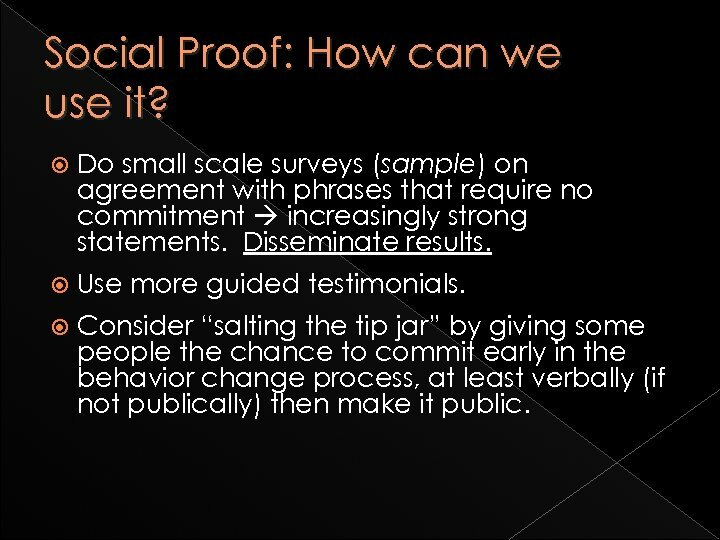 Consider “salting the tip jar” by giving some people the chance to commit early in the behavior change process, at least verbally (if not publically) then make it public. 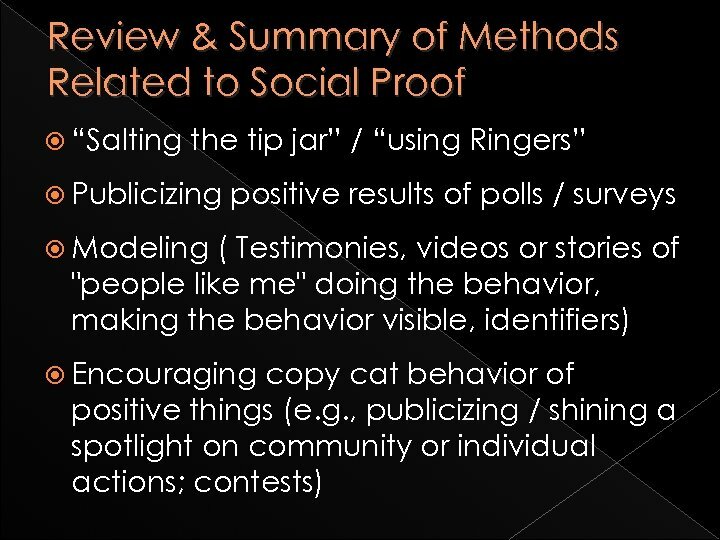 Social Proof: How can we use it? 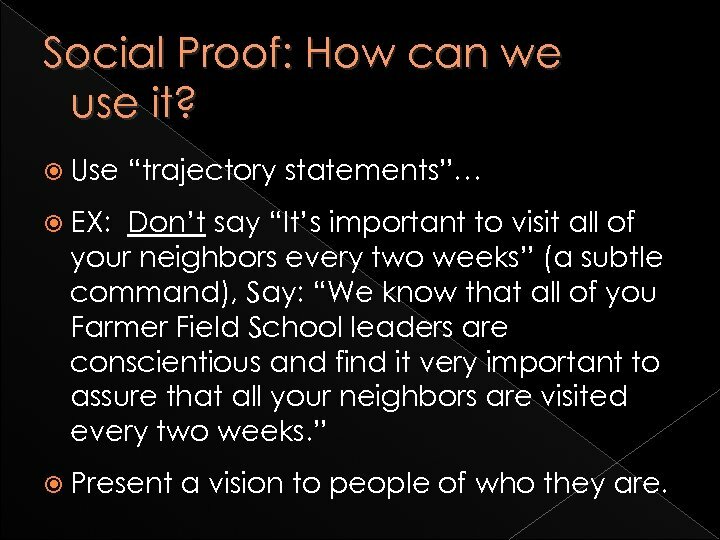 Use “trajectory statements”… EX: Don’t say “It’s important to visit all of your neighbors every two weeks” (a subtle command), Say: “We know that all of you Farmer Field School leaders are conscientious and find it very important to assure that all your neighbors are visited every two weeks. ” Present a vision to people of who they are. 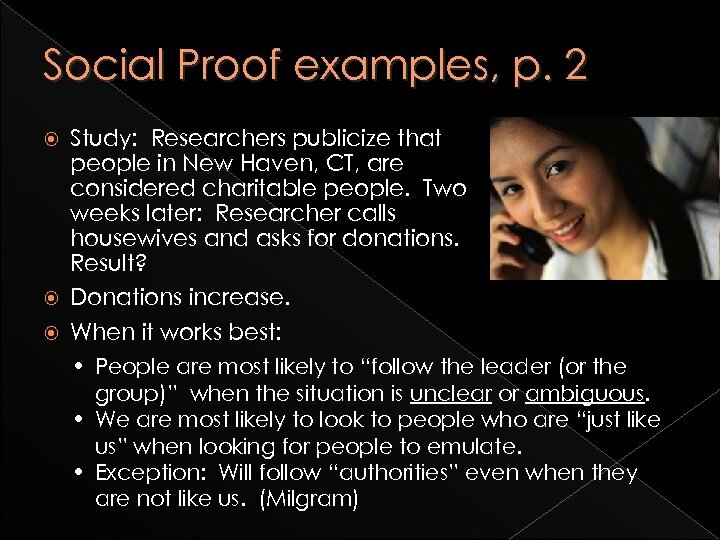 Social Proof: How can we use it? When looking for sub-commitments, ask specific people if they are willing to be the ones to first make the commitment prior to a meeting. When having trouble getting commitments, ask people in smaller groups. 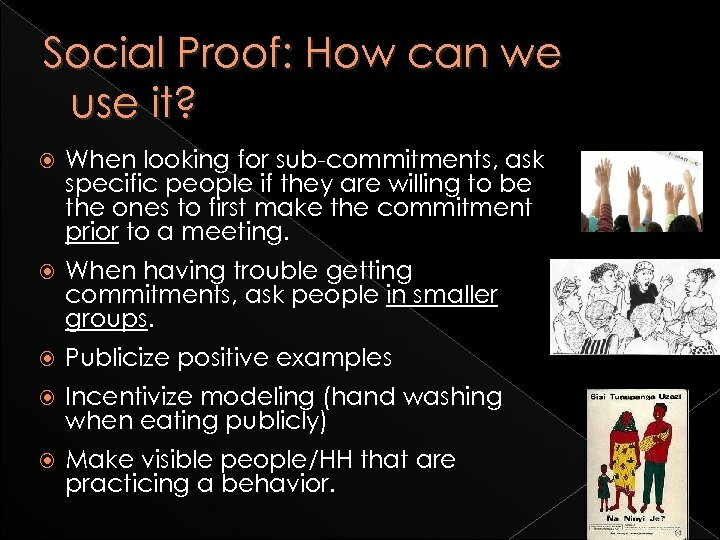 Publicize positive examples Incentivize modeling (hand washing when eating publicly) Make visible people/HH that are practicing a behavior. 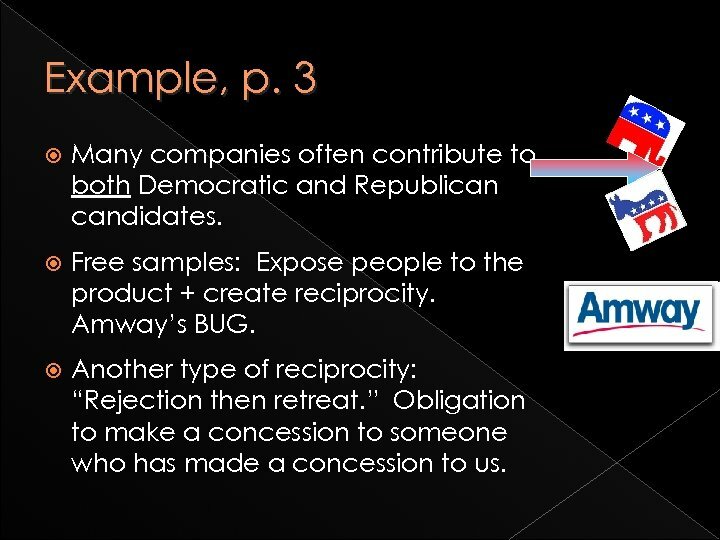 Example, p. 3 Many companies often contribute to both Democratic and Republican candidates. Free samples: Expose people to the product + create reciprocity. Amway’s BUG. 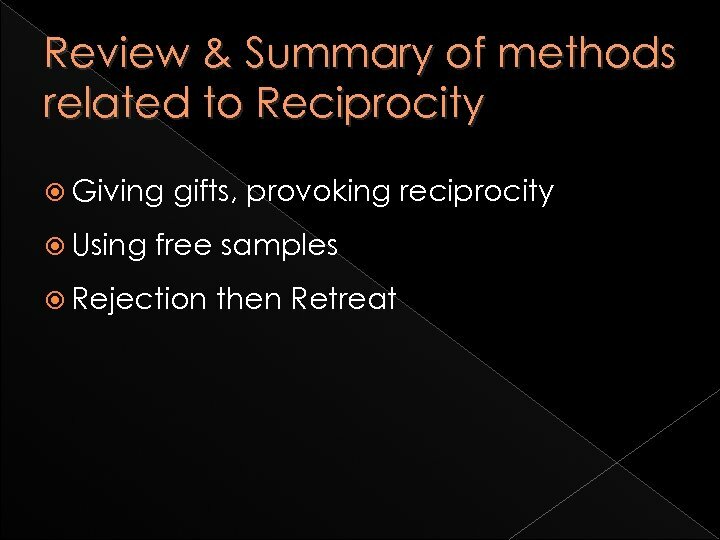 Another type of reciprocity: “Rejection then retreat. 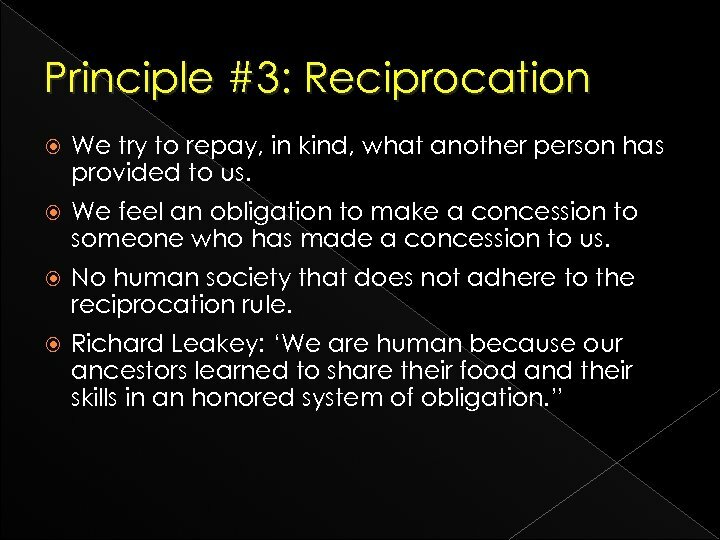 ” Obligation to make a concession to someone who has made a concession to us. 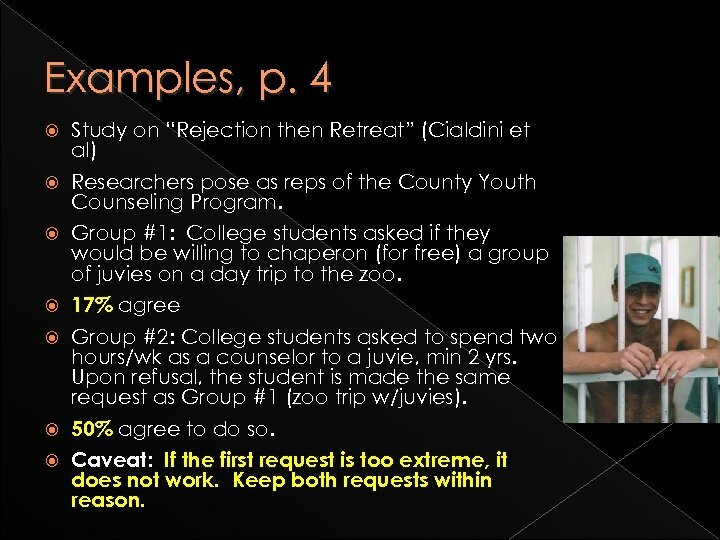 Examples, p. 4 Study on “Rejection then Retreat” (Cialdini et al) Researchers pose as reps of the County Youth Counseling Program. Group #1: College students asked if they would be willing to chaperon (for free) a group of juvies on a day trip to the zoo. 17% agree Group #2: College students asked to spend two hours/wk as a counselor to a juvie, min 2 yrs. Upon refusal, the student is made the same request as Group #1 (zoo trip w/juvies). 50% agree to do so. Caveat: If the first request is too extreme, it does not work. Keep both requests within reason. 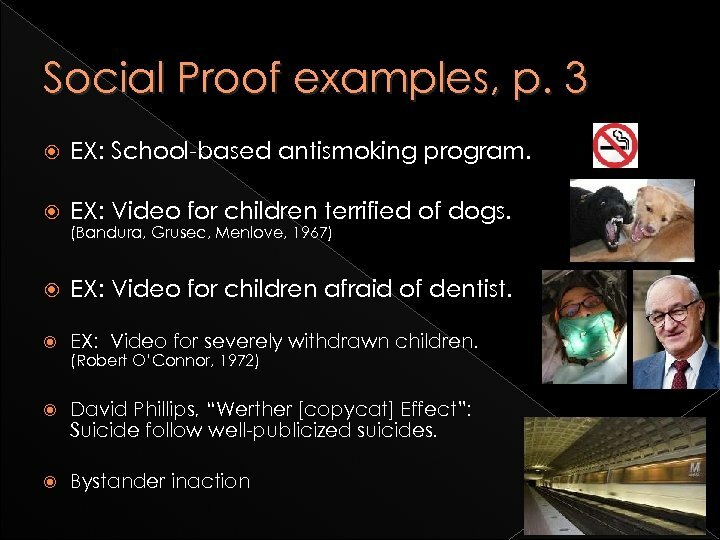 Examples, p. 5 Felt coercion? Follow-through? People feel more trusting of the requester and are more likely to follow-through with the commitment made. 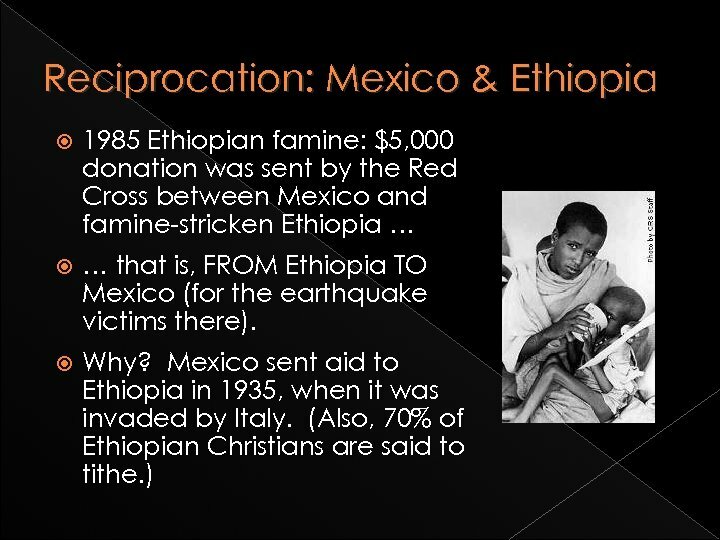 Ethical? Group #1: College students asked to give blood q 6 wks for 3 years. Then (upon rejection), asked to give a single pint now. Group #2: Asked to only give a single pint of blood right now. Those from both groups who agreed to give a pint asked for their phone number to receive a call to donate in the future. Examples, p. 6 Results? 84% who agreed to give a pint through the rejection then retreat technique agreed to donate later. Only 43% of the others did. 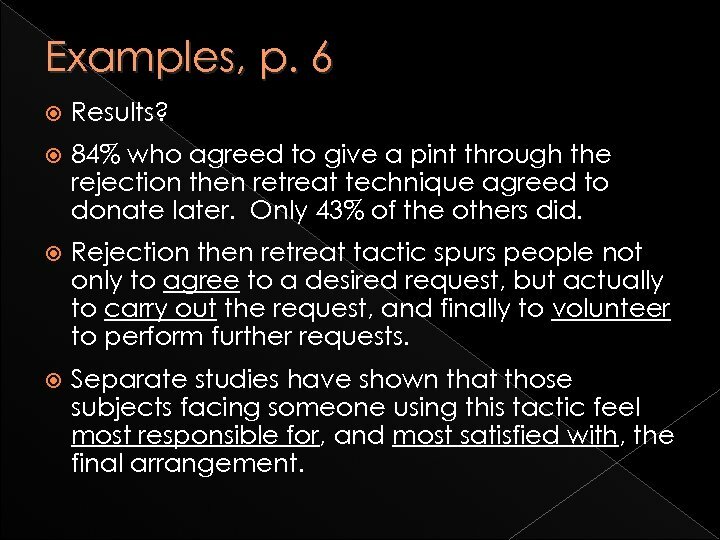 Rejection then retreat tactic spurs people not only to agree to a desired request, but actually to carry out the request, and finally to volunteer to perform further requests. 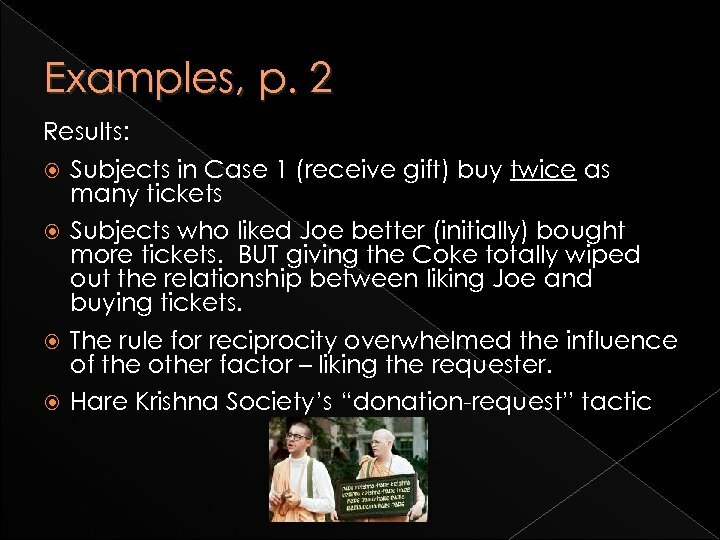 Separate studies have shown that those subjects facing someone using this tactic feel most responsible for, and most satisfied with, the final arrangement. 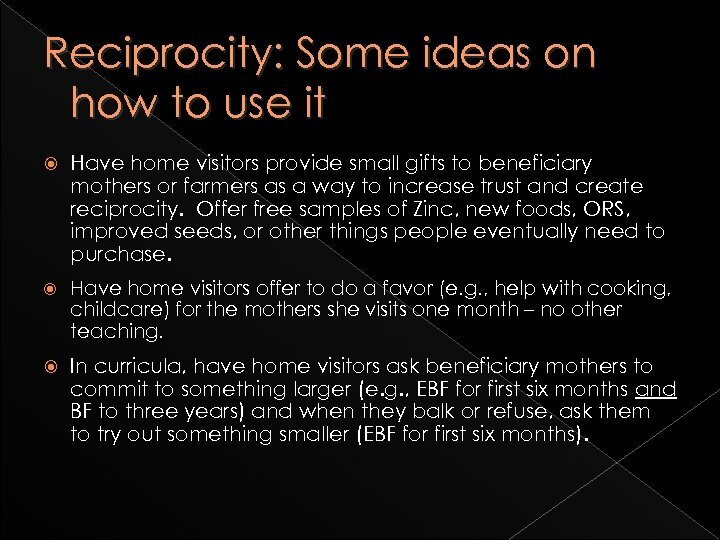 Reciprocity: Some ideas on how to use it Have home visitors provide small gifts to beneficiary mothers or farmers as a way to increase trust and create reciprocity. Offer free samples of Zinc, new foods, ORS, improved seeds, or other things people eventually need to purchase. Have home visitors offer to do a favor (e. g. , help with cooking, childcare) for the mothers she visits one month – no other teaching. In curricula, have home visitors ask beneficiary mothers to commit to something larger (e. g. , EBF for first six months and BF to three years) and when they balk or refuse, ask them to try out something smaller (EBF for first six months). Further Reading Click book titles for Amazon. com Listing… Influence: Science and Practice (4 th ed. ) 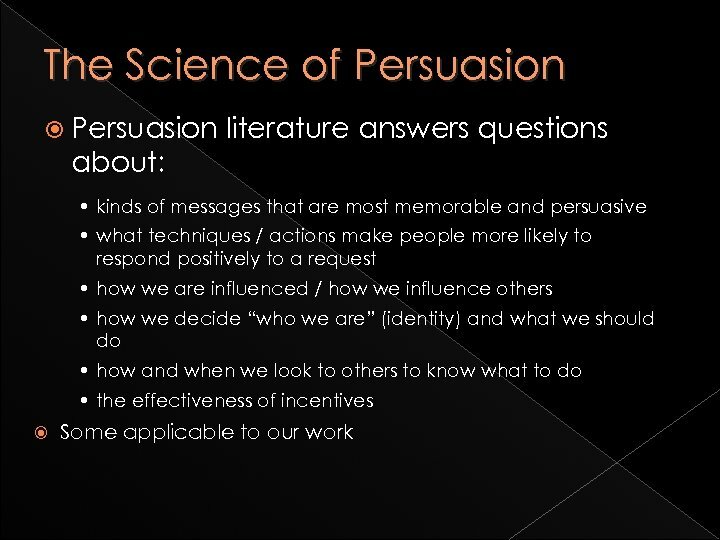 or Influence: The Psychology of Persuasion (Robert Cialdini). Translated into Spanish, French, Portuguese, Thai, Indonesian, Arabic, and 20 other languages. 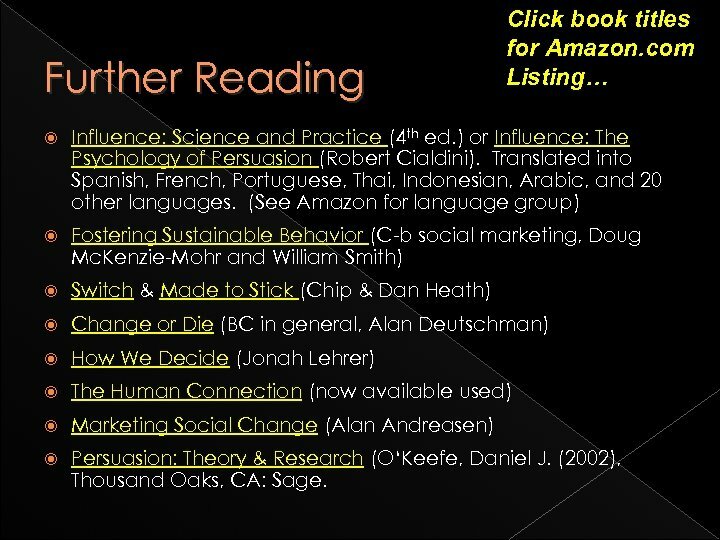 (See Amazon for language group) Fostering Sustainable Behavior (C-b social marketing, Doug Mc. 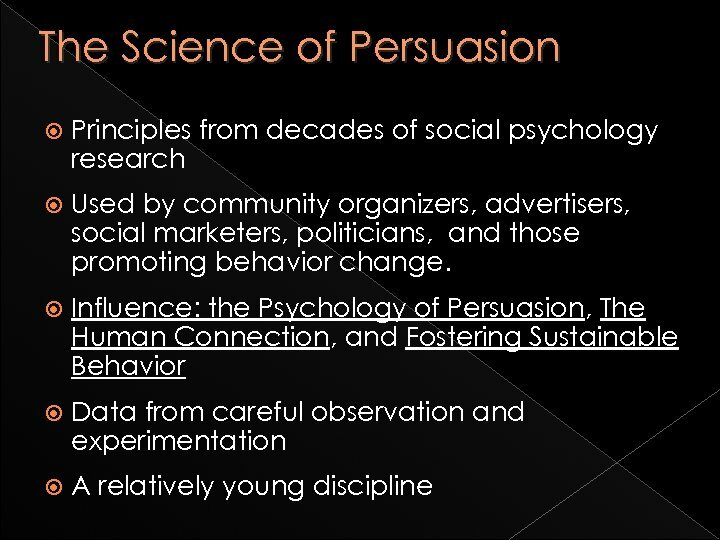 Kenzie-Mohr and William Smith) Switch & Made to Stick (Chip & Dan Heath) Change or Die (BC in general, Alan Deutschman) How We Decide (Jonah Lehrer) The Human Connection (now available used) Marketing Social Change (Alan Andreasen) Persuasion: Theory & Research (O‘Keefe, Daniel J. (2002), Thousand Oaks, CA: Sage.